Please Join and Support the Durham Chapter - NCCU Alumni Association for our first 5K Walk. 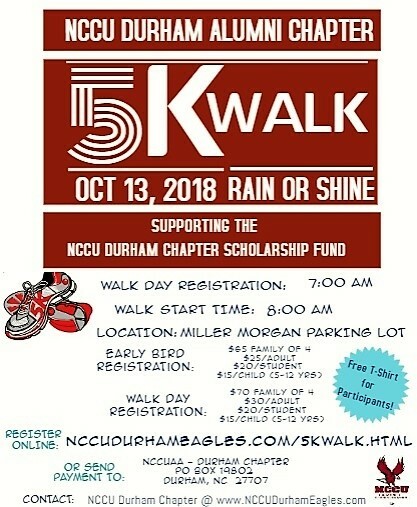 The 5K Walk will take place on Saturday, October 13, 2018, at North Carolina Central University to raise money for NCCU Durham area student scholarships. As a participant in the walk, you can solicit sponsors or contribute as an individual participant. Fill out or download the individual registration and / or the sponsor form and email to NCCUdurhamEagles@yahoo.com or mail to P.O. Box 19802, Durham, NC 27707. You may submit your selected 5K Walk registration contribution online, via our PayPal services. A 2.7% processing fee is included for use of those services. 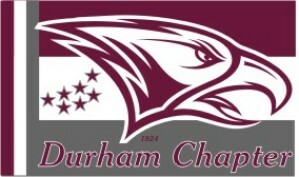 Your checks or money orders can be mailed to us c/o The Durham Chapter - NCCU Alumni Association, P.O. Box 19802, Durham, NC 27707. Our on site 5K Walk registration is at 7:00 A.M. at the NCCU Miller Morgan Building Parking Lot. Our 5K Walk starts at 8:00 A.M. Please make your online selection below for the Early Bird 5Kwalk Registration option. A PayPal processing fee of 2.7% will be included for each chosen 5Kwalk registration option. Please make your online selection below for the Race Day Registration option. A PayPal processing fee of 2.7% will be included for each chosen 5Kwalk registration option.